Can we support your own distributions? Many groups approach us and ask if they can fundraise for nets using the www.againstmalaria.com platform to fund nets they will distribute themselves. The answer is Yes - provided the distribution proposed meets certain criteria. We have set up a system to make it easy and simple for an organisation to apply to us to fund a distribution of bednets - but also ensure that any bed nets we fund go to the right places and have guarantees concerning timing, delivery and transparency. This involves completing a distribution form which is sent to our Malaria Advisory Group - a panel made up of some of the world's leading malaria experts with extensive experience both in the strategies used to combat malaria and in the implementation of malaria programmes. More details on this process can be found here. If this Group approves the proposal you can then go ahead and you can use our on-line platform. The benefits this bring are: the ability to fundraise online at no cost; donors and supporters can leave encouraging messages when they donate; they can see at any time the total funds they have raised; we add their distribution to the website and link all donations to the distribution so donors really see where the nets they have funded are going; post-distribution, they see pictures and video footage of the distribution so they really, do see what they funded. Of course there is the additional benefit that 100 per cent of the money raised buys bed nets at the world's lowest cost, thereby maximising the number of nets you can get for you money. This is a link to an article just published on a great SurfAid initiative which we have also been helping. Check out the article and you can see here and here what our role has been. 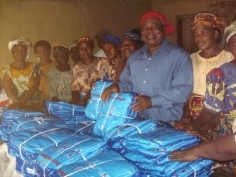 Last year, we organised a distribution of 240 bed nets to Sumbe in Cameroon. You can see the details and some pictures here. Usually pictures or video together with the completion report from the distribution partner are all that we get to see. This is great because it is what we need to provide the transparency and proof of action that is fundamental to how we go about things. However, it is always nice to receive slightly more informal feedback about the impact on the lives of the people concerned. That is why we were very pleased to receive this from Gilbert B. Ayuk, a native of Sumbe but who now lives in the US and was reporting back following a visit to the village. Cameroon, I wish to thank all of you at the Against Malaria Foundation and your principal partners for your donation of 240 nets to the people of our village. Your donation has led to a blanket covering of all sleeping spaces and has led to a dramatic fall in the incidence of malaria in a village that is located deep in the tropical forest ofAfrica. The people of Sumbe village are appreciative of your coming to their assistance. A year ago, Todd Lawson and Christina Tottle set off on motorbikes to travel the length of Africa both raising money for, and also distributing, bed nets. We helped organise the logistics for this and created with them the "Motos Against Malaria" initiative. They have finally reached the end of their epic quest having travelled over 23,000 kilometres through 15 countries. You can read all about their journey here and see some more wonderful images. If you want to support them, you can find their fundraising page here and here is where you can track the places in Uganda where they were able to distribute many of the bed nets their money funded. Remember also, we can work with you to create your own fundraising initiative. Next Friday, the Boston Celtics are going to be honouring Jessica Kraft - the leader of the Beantown Skeeter Beater team which won the Madness Against Malaria competition two years in succession, raising over $17,500 which bought 3,500 bed nets. Jessica will receive the “Heroes Among Us” award at the Celtics’ home match of Friday 13 March. This award was set up to recognise people who have made an overwhelming impact on the lives of others. Madness Against Malaria is a challenge where teams compete against each other, over a series of rounds, to raise money to buy bed nets. Jessica’s team comprised people from the Rotract Club of the Boston University School of Public Health with the support of hundreds of people from across Boston and they won both the 2007 and 2008 competitions. They are also entered in the 2009 competition, which is nearing the end of its qualification period before the time when teams competed directly against each other. You can watch their progress here. It is also not too late to enter your own team. We hope to get some pictures from the event next week which we will post up here.